We at GTSIGNS.COM would like to take this opportunity to introduce ourselves and our versatile line of products and services to you. We are a sign sales and service business that has been in operation since 1963. 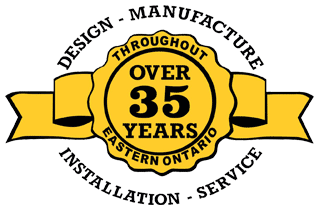 We serve clients throughout Ontario including Ottawa, Carleton Place, Smiths Falls, Arnprior, Renfrew, Perth, Cornwall, Brockville, Kingston and Toronto. We are continually exploring ways to serve our customers' signage and advertising needs better and are capable of meeting all your signage requirements. We have helped customers solve their signage needs in many unique ways as well as the tried and true methods. Lettering helicopters going to Africa or manufacturing magnetic signs for a small company promoting their business locally we enjoy the diversity this industry provides. Design, manufacturing, servicing are all services we offer. Your sign is your first impression! We want that first impression to make money for you! Whether it is magnetic signs for your vehicle or a total wrap, illuminated signage or LED channel letters or a more basic sign simplistic in its message we can help you create an image within your budgetary confines. Perhaps you an awning is the best way to showcase your business. Digital message signs are up and coming in this area and make a huge impact on the traffic passing by your business. You can choose from many different types and styles of signage....heritage signs, sandblast signs, vehicle and equipment lettering and wraps, architectural letters, billboard, storefront, a-frames, or an assortment of other techniques to get your brand out to your customers and grow your business. Bag signs, site signs and coroplast signs are all ways to get your business noticed. Let us help you find the solution to your signage projects. If you have signage requirements you would like to discuss with us, please call the sign line at 613-253-SIGN or email us through the Contact page. Thank you for taking the time to let us introduce ourselves and we look forward to the opportunity of working with you to "Sign your Success".